Kafue is the largest national park in Africa (8,697 square miles/22,532 km2), with tremendous diversity of habitat and of mammals, some of them exceedingly rare, ranging from elephants, lions, leopards, to red lechwes (unique to Zambia), Cookson’s wildebeest, Defassa waterbucks, Lichtenstein’s hartebeest, and more kinds of antelopes than any other African park. Wildlife conservation in Zambia goes back before pre-colonial days when tribal chiefs set aside traditional grazing and hunting grounds for their personal use. The first reserves were formally established in 1925. Now more than 30 percent of Zambia’s 290,586 square miles (752,972 km2) are national parks and conservation areas for wildlife and another 10 percent are protected forest reserves. Enlightened programs in which government works with the U.S. Agency for International Development and others in a group called ADMADE (Administrative Management Design for Game Management Areas) gather public support for these by providing benefits such as wildlife activities—jobs and locally beneficial projects for communities. In the program’s encouraging first three years, elephant poaching was cut 90 percent and rhino poaching almost to zero. Zambia’s elevation on a 3,000–5,000-foot (915–1,525-m) plateau moderates what would otherwise be a torrid climate, just 10–18 degrees south of the equator. April–August is cool and dry; September–October warm and dry; November–March, warm and wet. International travelers usually arrive by air in the capital, Lusaka, which has lodging and rental cars (roads around the country often require 4WD). Some remote parks have little or no access, but the best-known have lodges and visitor facilities ranging from comfortable to luxurious. Bangwelu Wetlands is an enormous beautiful area surrounding Lake Bangwelu, home to thousands of black lechwe, breeding ground to rare shoebill storks; protected as a game management area. Blue Lagoon National Park comprises a wetland area with huge herds of Kafue lechwe and spectacular numbers and varieties of waterbirds. Kasanka National Park is the world’s greatest breeding ground of fruit bats, with a large population of water-loving sitatunga antelopes, also pukus, many hartebeest, sable antelopes,waterbucks, and shoebill storks. Lochinvar National Park is main stronghold of more than 30,000 Kafue lechwe; also 2,000 blue wildebeest, oribi, side-striped jackals, and more than 400 bird species including abundant wattled cranes. Originally a private ranch, it was bought by the Zambian government with support from World Wide Fund for Nature. Mosi-Oa-Tunya (Victoria Falls National Park) contains the spectacular Victoria Falls, one of the natural wonders of the world, located along the Zambezi river on the border with Zimbabwe and near to those of Namibia and Botswana—largest sheet of falling water in the world, with both sun and moonlight rainbows on its spray and vapor clouds visible 18 miles (30 km) away.Can be seen via sunset cruise and canoe safari. White-water rafting below can be enjoyed by the most inexperienced visitor—just grab a rain jacket and hang on—keeping an eye out, if possible, for buffalo, elands, elephants, giraffes, and others along the shore. Nyika Plateau National Park has a great variety of orchids and butterflies, also Moloney’s monkeys, blue monkeys, leopards, serval cats, and several bird species not seen elsewhere in Zambia. Sumbu National Park borders the huge inland sea of Lake Tanganyika, visited by elephants, lions, elands, pukus, roan antelopes, blue duikers, and Sharpe’s grysboks along with hippos, crocodiles, and waterbirds. 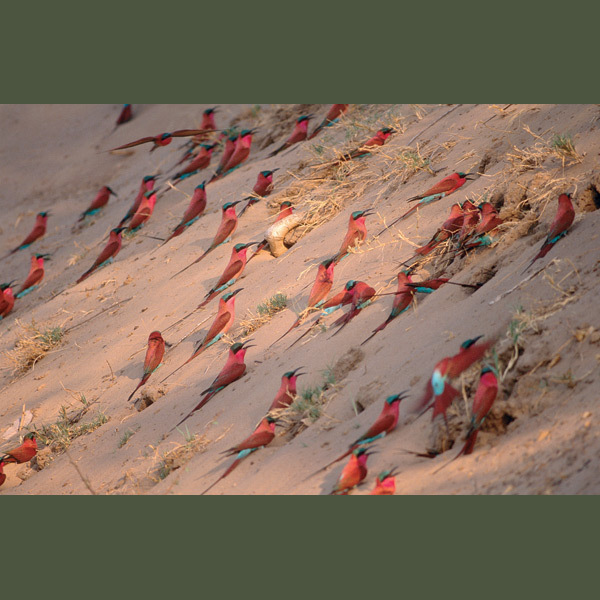 Melodious carmine bee-eaters are welcomed everywhere (except by bee-keepers). They like to colonize along streambeds where they raise young in burrows they excavate on banks, lining nests with remains of their prey which is 90 percent bees, consumed after they have pounded them violently to de-venom stingers.